Malfunction of the temporomandibular joint (TMJ) is an extremely common condition that affects a broad spectrum of individuals. 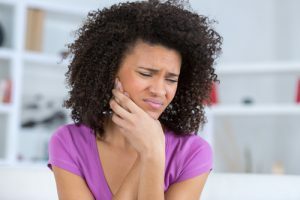 If you are experiencing pain in your jaw or head, or if you cannot bite or chew without difficulty, Encinitas dentist Cathy Santone, DDS can help you restore proper function of your jaw joint with a comprehensive treatment plan tailored to treat your TMJ symptoms. What is TMJ Disorder (TMD)? TMJ disorder is a condition in which proper function of the jaw joint is disrupted. This can happen for a variety of reasons and the exact cause of TMJ malfunction is usually different for each patient. In any case, individuals with TMJ disorder typically experience jaw pain, tension, aching, or discomfort when the defect goes untreated, with symptoms often radiating to the entire head and body. Like any medical condition, the best way to address TMJ disorder is through proactive treatment and qualified care from someone with experience treating temporomandibular joint-related problems. There are many patients who visit our progressive dentistry practice for their TMJ concerns and Dr. Santone, as well as our skilled team of dentists, is well-versed in examining TMJ concerns with the goal of identifying the root cause of symptoms, and treating the malfunctions accordingly. With effective treatment, patients can restore their physiological wellness and achieve relief from their TMJ pain. As the point of fixation between the jaw and the rest of the head, the temporomandibular joints enable jaw motion. When working properly, these joints allow you to chew, speak, yawn, or otherwise open and close the mouth with ease. However, if the TMJ undergoes stress and becomes inflamed—or there is a disruption in the delicate balance between the muscles, cartilage, nerves, and blood vessels surrounding the TMJ—movement of the jaw can be difficult or even painful. TMJ disorder, commonly referred to as TMD, can encompass a wide variety of impairments in the jaw joints. Feelings of stress can also create tension in the jaw joints, as individuals commonly tighten their facial muscles or clench their teeth together when they are under emotional duress. If you think you may be affected by TMD, Dr. Santone can work with you to determine what mechanisms are causing your symptoms. What TMJ Treatments are Available? Our dentists will first perform an evaluation of your jaw structures during a consultation to make an accurate diagnosis. They will review x-rays, examine your bite, and assess whether the jaw is able to open and close with fluid motion. After it is determined that your symptoms are being caused by TMJ disorder, there are a number of ways to treat TMD— most of which involve minimally invasive techniques. In many cases, simply wearing a customized mouth or night guard can reduce stress on the teeth and jaw. For patients who are prone to grinding and clenching their teeth, this can help relieve pressure on the jaw joint as well as alleviate pain around the jaw and facial musculature. In other situations, therapeutic injections of BOTOX® Cosmetic have been proven to relieve pain caused by the muscles surrounding the TMJ. As the formulation works as a neuromodulator that can limit muscle function, BOTOX® Cosmetic can be used for medicinal purposes to reduce stress on swollen facial muscles and minimize the incidence of teeth clenching. At any rate, Dr. Santone and our team will develop a personalized treatment plan tailored to best treat your particular case of TMD so that you can enjoy life free from TMJ pain. Questions? To learn more about TMJ disorder, or to schedule a consultation with one of our experienced dentists, please contact our practice today.